If I do not move he will not see me. Sometimes you just have to sit back and smell the flowers. Be wary of Black Squirrels bearing gifts. Oh! Never mind, here it comes. Excuse me sir! Do you know when the bus comes? Very interesting gallery. I was born in the Bronx, NYC where many of the squirrels were black. I live in NJ now where there are no black squirrels (that I have seen). I wonder if black is an urban adaptation that provides camouflage from raptors. Wonderful gallery with some nice shots.V. Great Gallery and great sense of humour!! The way you've captured the light in many of these is just stunning. Am contacting you in hopes of getting your permission to use in my next book. I love squirrels! Your photos are fabulous. 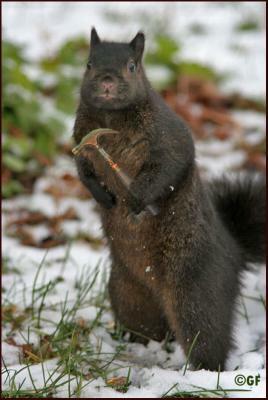 A fun gallery....I love the little critters except when they get on my bird feeder! Fabulous gallery, your work is great. I loved all pictures!! Will be back for more. This is a great gallery. I bet you could sell many of these to a greeting card company. Wow! - my favourite animals - as never seen before. So clever - superb! Beautiful collection, your images are wonderful! You really are amazing. I have never seen squirrel photos this beautiful. Best squirrel gallery I have ever seen! I have squirrel pics too, but your variety and excellent captures make mine look borrrring! Voted. I'd love to see "The House That Squirrel Built"